Have you noticed that the ‘older’ part of ‘older but wiser’ is singularly obvious in wrinkles, aches, and the need for Post-It notes littered over every surface – but the wiser part is much harder to recognize? Especially when the dog mouths one of those Post-It notes, and you have to make an extra trip back to town for the three forgotten items of the six that you need to make supper. How delightful, how ego-boosting it is, then, when circumstances allow you to recognize that the ‘wiser’ at least occasionally manifests. A recent experience allowed me to feel grateful for whatever passes for wisdom in my brain. I had thought to pursue a course of study which would require me to hold in equal respect two conflicting paths to spiritual understanding. My training directed me along one path, my mental inclination tempted me onto the other. The studies would have meant constantly balancing two goals, two world views, two concepts of self. The outcome of the program would have enabled me to practice in a field I’d like to enter, for which I do not – at least at this point – see another means of qualifying. So I did all the paperwork, wrote the essays, completed the application – and then was denied acceptance. What to do now??? Here’s where the wiser comes in. I did nothing, just let the fact of the denial settle into my awareness. Within a few days, I had one of those blessed “aha” experiences, a flash of insight that allows me to lay at least passing claim to wisdom. Recognition is enough! Seeing the differences between the two paths, understanding how different aspects of myself are drawn to each of them, and knowing that I am capable of continuing to follow one while learning the other – that is the recognition. And it is enough. I don’t have to also undergo the stress of carrying awareness of the paths and their differences through a two year course of study. Wiser seems to be at work in my growing ability to move through a mine field of life choices while maintaining a ‘neither for nor against’ mentality. Older is definitely a handicap in my search for paid employment. I cannot help but believe that the on-line application and screening systems which substitute for preliminary job interviews include an edit that discards all applications with college graduation dates before 1990 (the application isn’t accepted if a graduation date is left blank). No other explanation accounts for a year of denials of my applications for positions for which I meet every criterion, which mirror work I have already done successfully, and which are written using all the key words of the job description included in my work summary. Wiser allows me to keep the constant rejection at arm’s length, not translating it into a feeling of personal inadequacy. The right income opportunity will come my way, so long as I keep an open, explore-everything approach to the search – and all this rejection is good practice for the inevitable “send out twenty stories to get one accepted” that mark a writing life. Older is what I will be – starting another decade – on my next birthday in the autumn. Wiser is what I hope also to be by then, having learned the parameters of a new job which I’ve been offered, and having experienced yet again the virtues of patience. I’ve been hired into a position which exceeds every criterion I had set – flexible hours, service to others, supportive and enjoyable coworkers. And I have almost two months to discern how to maintain my established writing pace while fulfilling the job’s requirements. I’m old enough to know that won’t be easy. Hopefully I’m wise enough to know both how important the writing is to my sense of well-being, and how possible it is to “have it all.” With patience, I will see the way. It seems to be perversely part of human nature to never be satisfied. Through months becoming years of drought, we in the northeastern New Mexico high-mountain desert worried about the lack of rain. Our brown grasslands, swirling dust devils, raging fires and smoke-poisoned air were prominent in every conversation. Until just a month ago, when suddenly, for some of us, things changed. Water began to come out of the sky, in thick sheets, on almost a daily basis. Not everywhere, not for long periods of time, but enough where it did appear – including where I live – to turn the prairie green and yellow – green weeds shooting to chest height, yellow wildflowers making wide swaths of color especially where run-off water has pooled. Now I hear complaints of pollen-allergies, and worries about the burrs and needle-like seeds that will permeate everything – especially the fur of four-legged pets – as soon as the short-lived grasses and flowers dry out this autumn. People hustle to find mowers and weed eaters, to chop down the lush growth, the absence of which was so recently bewailed. 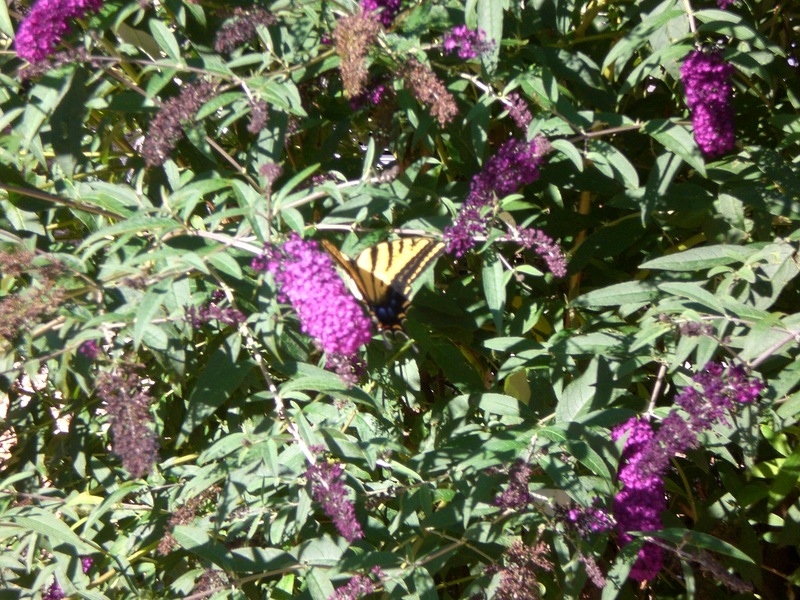 Today, the sun is shining, there’s a cooling breeze, hummingbirds are hovering over the purple thistle flowers, and a dove is pecking seed from beneath my bird feeder. A few puffs of cloud float in a dust-free postcard blue sky. I’ve had to use the snips designed for nipping small limbs from trees, to cut down the largest red-root weeds blocking the steps to my home. A friend has promised to come mow, before I have company over Labor Day weekend. 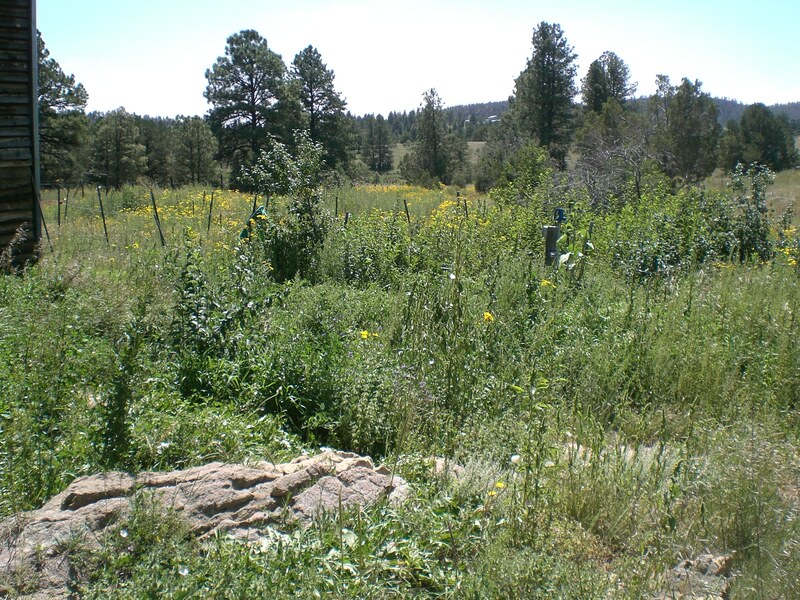 Not all my acres, just the area immediately around the house, so I can get to the bird feeder and the outside water hydrant without wading through chest-high weeds. So my guests can get into the cottage door without scratches to their legs and prickers in their clothes. Nothing I can do will prevent the forthcoming torment to dogs and cat. Daily brushing, sessions of picking out burrs, even a close shearing of coats (canine at least) can reduce but not eliminate the pending assault by things that stick and sting and burrow into skin and paws. It’s been so long since we’ve had rain, and weeds, in summer that none of the current crew of pets has experienced what is in store for them. They are all too young. I am not too young. 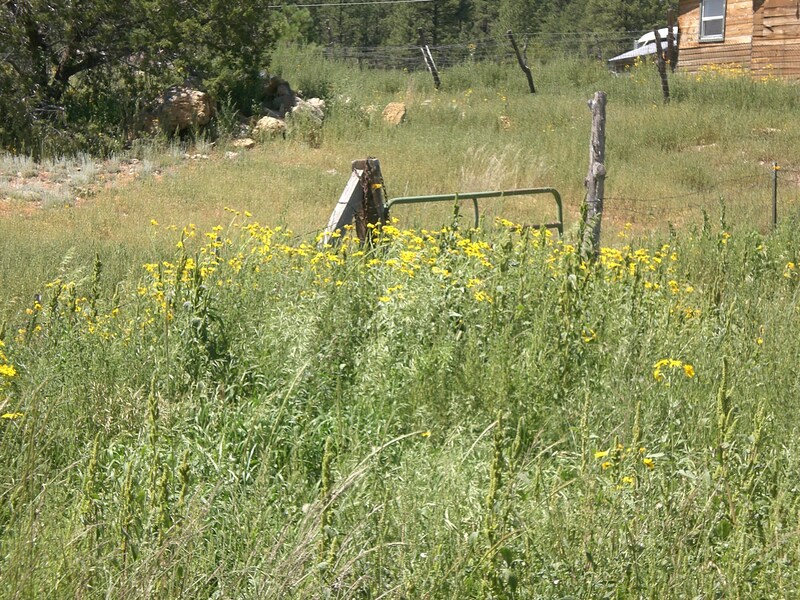 I remember, ten years ago, the last time we had summer rains and weeds and wildflowers and enough grass for horse hay to be a reasonable price. I remember the quill-like needles that result from those pretty yellow wildflowers dropping their petals, drying and disseminating their seed. I remember the cockleburs, brown and clawing, so sharp they pierce the leather of my shoes as I walk by them; so sharp they even caused my horses to limp until the spines were picked out of their hooves. I remember, but today I will not complain. Today I enjoy the sun and the cool breeze and the green vistas and the dancing yellow flowers. Today I am grateful that we have had rain, and a respite from dust and fire and smoke. Today is a good day to Be. For the past year I’ve been living in a way most of us are taught not to… day to day, with no ‘life goals’ and few plans that reach more than a week or two into the future. It’s a natural way to be; children wake each morning to a truly new day, one full of possibilities. They have to be trained to ignore distractions and to stay focused on mandates – good grades, keeping a room picked up, personal cleanliness, helping with household chores, thinking ahead. Oh yes, thinking ahead. You didn’t make your bed when you should have done, so now you have to do it instead of watching your favorite TV show. You should have thought ahead! You’ve been skimping on your homework, now you’re failing 5th grade, though you’ve been warned over and over. You only have one six week grading period left to bring your work up to acceptable level. You’ll be doing nothing but school work from now until the term ends. No trips, no play, no time for fun… you should have thought ahead! Sorry, Mom and Dad, but I’ve been determinedly not thinking ahead. There is a point, ahead out there somewhere, when I will run out of savings and, without income, be destitute. I’m not ignoring that fact, but I’m not focused on it. My wise teacher instructs that attention is food – what one attends to grows in one’s life. I see no benefit from worrying about a maybe some three years off into the future, so I am attending to what is here with me in the present. I have been searching job boards, applying for everything that seems a possibility. Like many older people in the job market, I get few responses. Experience seems not to be valued any longer. Employers want new young minds to train to their special priorities. They want to mimic parents, who know instinctively that training children to think ahead, plan for the future, and learn habits of daily living is easier when the children are young and haven’t yet had enough experience to question the parental dictates. So how do I communicate, in a standard application and resume submission, that part of my experience has been learning to be open to new ways of doing things, new goals and new achievements? Do I say that I have been living day to day for a year now, proof of my ability to be flexible and adaptable? Do I use, in a cover letter, another image from my spiritual teacher, of riding a horse up a creek and, at a moment’s notice and for no conscious reason, jumping the horse up onto the bank? Knowing when to listen to one’s inner voice (intuition, or spiritual knowing) can indeed be the skill that saves one, in what turns out to be the nick of time, from a tumultuous flash flood gushing down the creek bed. Asked what I’m looking for in new employment, I could perhaps best answer by saying I seek the employer who will appreciate the depth of meaning in my teacher’s story. Or one who could read Lesley S. King’s recent post entitled Face Your Inner Mischief, about her yapping mind, and understand it for the beautiful parable it is. I seek an employer who has the ability to appreciate the innovative, the creative, the self-directed in others because that is what he/she is also. Someone not threatened by new ideas, not hearing questions as challenges to authority but rather as the positive contributions of an assistant engaged in the process of achieving goals which, themselves, may shift with time and experience. Nonetheless, there is a way in which I still embody the underlying lesson my father – and most parents – try to teach their children. That silent message is about acquiring the ability to choose – i.e. to have an understanding of cause and effect, an ability to be patient long enough to experience outcomes, and a sense of what information comes from within one’s being and what is imposed from ‘outside’. With these three skills, one can choose – to follow outside dictates or respond in opposition to them; to stick with an unsatisfactory job or to leave it without another already in place to go to; to value integrity more than security, or patience more than impulsiveness. Ultimately, it is our choices – or lack of them – that define our lives. Lucky is the child of a parent who knows to teach how, but not what, to choose. Blessed is the individual who learns from a spiritual teacher that worlds exist beyond the mundane, and that we all have within us the capacity to manifest Truth, to Hear the Word, to be led by the Holy Spirit, in whatever language or manner of Knowing we choose to embrace. May we all make our choices such that we can sum up our lives as contentedly and succinctly! 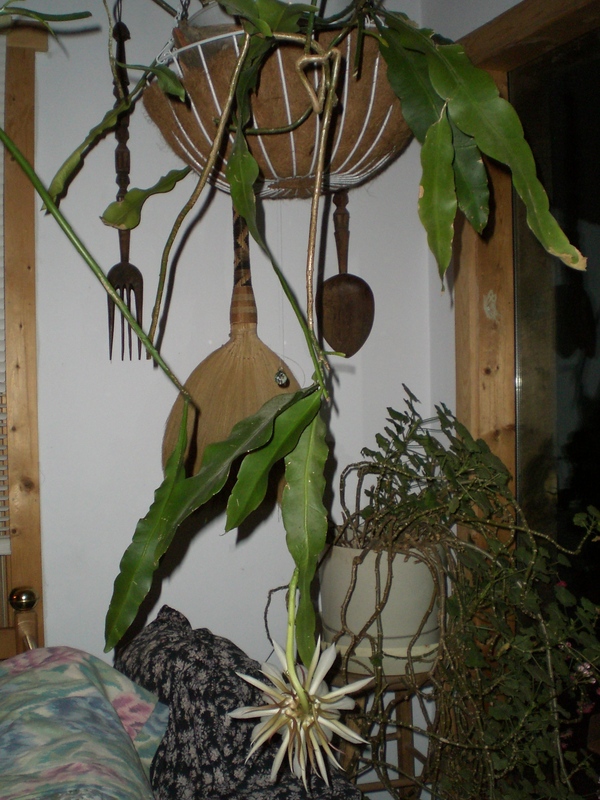 A night-blooming cereus hangs from the ceiling of my living space, in a large pot supported within a chain and wire basket. It sends ‘arms’ in all directions, tries to push tendrils between the cracks of a beam and board ceiling, and generally does its best to mimic the hedge of its natural, wild state. Periodically I have to detach bits that are adhering to nearby window shades, or creeping through the ornamental Asian brooms hanging on the wall close to the plant. The cereus recreates a jungle environment for a large wooden fork and spoon from the Philippines and two woven straw brooms from Vietnam. And every so often, it blooms. On rare occasions two blossoms at once. The flowers begin as tiny shoots attached to a leaf, indistinguishable from those which will in fact become new leaves. They seem to hide themselves among the foliage for a week or more, until they become large enough to be recognizably a flower bud. They then take an additional several days to enlarge, standing outward at a sharp right angle from their support, before opening fully late one night (usually close to midnight). During the brief hours of full bloom, the flowers give off a delicate sweet scent, a single flower sufficient to perfume the ten-by-eighteen foot room. 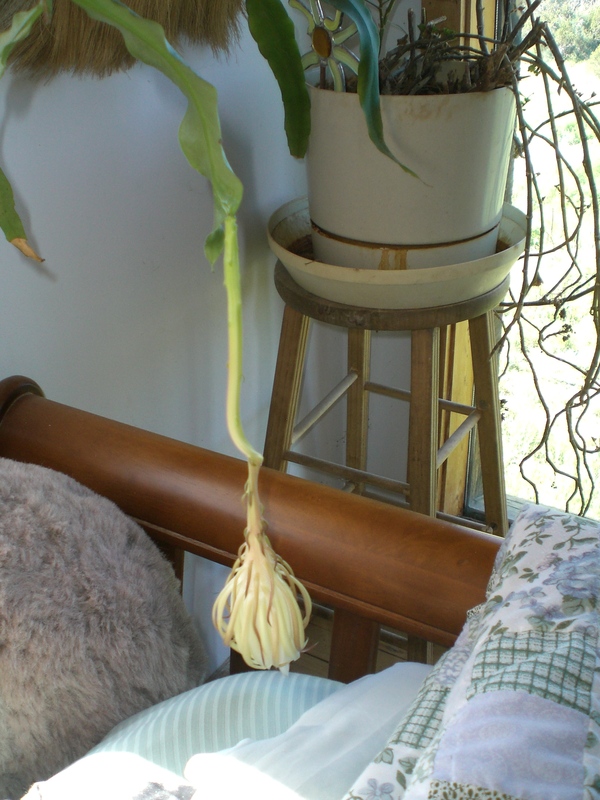 Over the next few hours the flower closes and its supporting stem collapses, so that by morning the entire leaf appendage is hanging straight down and the leaf seems to beg for relief from the dead weight. As often as I have watched this process through (admittedly not staying awake much after the fullness of blooming) I remain unable to predict exactly which night the flower will choose to open, nor have I been able to discern what triggers the plant to produce a bloom. It has flowered in all seasons, no more frequently when on a diet of bloom booster than when it is only given water. Sometimes, the shoot-to-bloom process takes six days, others it takes almost two weeks. 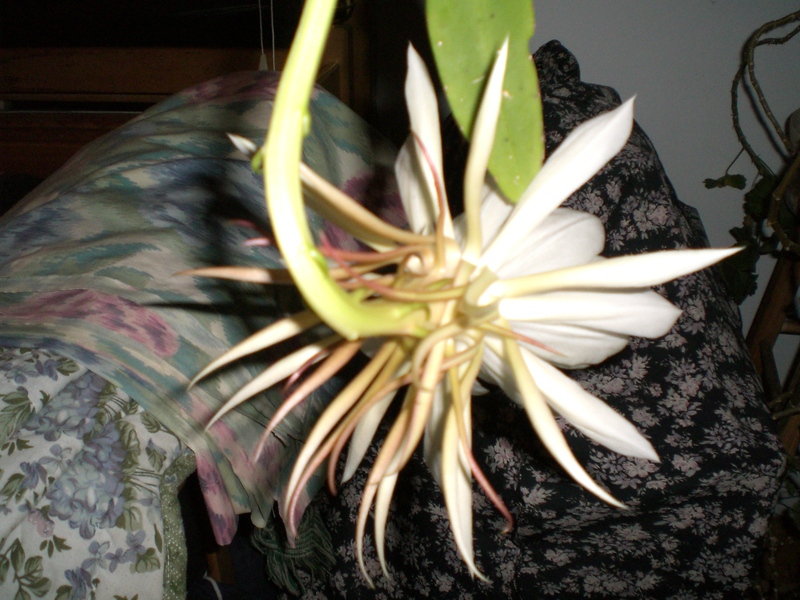 Cereus fans whom I’ve found online tell similar stories of inability to predict blooming. 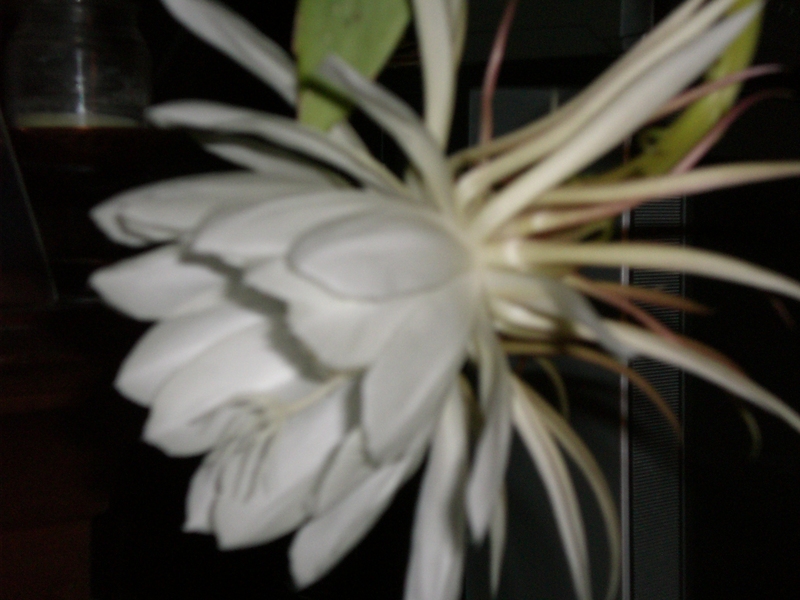 One lucky person lives with a cereus “in its natural habitat” as a hedge, and is able to enjoy flowers night after night, perfuming her entire garden. Cereus flowers are the unexpected, unpredictable sweet things in life, arriving unnoticed, while our attention is elsewhere – on daily chores, dwindling bank account, or perhaps the aches and physical challenges of aging. Focused on job applications, I come across an email from a friend, appreciative of some quality I’ve begun to doubt can be seen by potential employers. Engaged with the daily task of treating my Shih Tzu’s eye, I am surprised when his kisses replace his usual wriggly impatience with my care. And wading through waist-high weeds to reach the bird feeder, I curb my irritation at the discomfort, instead appreciating such a vital, flourishing response to rain in what has been a desert wasteland. We are admonished to remember to ”stop and smell the roses.” Roses have thorns. There are all sorts of philosophical and historical entanglement associated with roses. So I prefer to think of the many gifts I receive – a funny, affectionate limerick from a friend, a smile of welcome from a cashier, glorious banks of cloud in sunset hues – as daytime cereus blossoms, all the sweeter for being for being unexpected and transitory. I wonder if the hardest part of getting older is not the challenges of coping with a failing body and mind, nor the inevitable sorrow of losing friends and peers, but the gradual – or sometimes very sudden – loss of illusions, loss of aspirations, loss of hope. At some point we all face the recognition that a cherished desire or goal is not going to be fulfilled. What then? Psychologists have given labels to the behavior engendered by some of these confrontations – empty nest syndrome and male menopause being the most prominent. Those two experiences are primarily about accepting transitions in one’s life path rather than about loss of a way forward. It may be hard for a mother to accept that her children are grown and must be allowed to live their own lives while she redefines herself – she will still be a mother, but engaged differently in the lives of her family. And just as business managers must adapt their style when a company transitions from growth to maintenance mode, so some men must accept – at some point in their careers – that they have reached a plateau where they may expect to be for the rest of their working lives. Except, of course, that creative men and women reinvent themselves, begin new careers, take up new interests and continue to make contributions to their community, their families and themselves, often to the end of their days. Of what is that creativity made? Is it something more than a stark refusal to concede to lost illusions, lost aspirations, lost hope? Consider a particular expectation – that of finding someone with whom one can walk life’s path, a partner to share the joys and sorrows, someone to ‘be there’ when support is needed. Some of us are lucky enough to find such a mate. Almost all of us are given the expectation that we will be in that lucky group. We read novels about these ‘good’ marriages and we see – or think we see – examples around us. We may or may not also learn that romantic love doesn’t hold up well to the stresses of married life, but that if again we are lucky, we discover a more stable, enduring form of love that does survive the inevitable losses life brings. Above all, if we are lucky, we find someone with whom we can share (and thereby halve) the pain, and share (and thereby double) the pleasures life brings our way. Those of us who are fortunate enough, wise enough to let go of the demand for a single person to fulfill the human need for companionship often find ourselves with support in unexpected but very meaningful ways. When I cracked my spine in a horseback riding accident, a neighbor showed up daily to do my chores and another took off from her work whenever needed, to drive me to my own work and appointments. And years ago, after the love in my life was yanked away, an acquaintance from the Quakers volunteered herself into my new home to help me unpack and settle, and to hold me while I cried. My spiritual teacher instructs that attention is food. What we give attention to multiplies. Inversely, the way to remove something unwanted from one’s life is to simply take one’s attention off it. Focusing on what is missing from life (a forever mate for example) will only push the possibility of finding one farther away. Psychologists have used transactional analysis to spell out the emotional dynamics of this truth, and shown how unhealthy, unequal relationships are formed from neediness. Most are unfulfilling and unsustainable. In the end, they rupture and dump the needy person right back where he/she began, in the classic cycle of repetitively marrying an abuser, an alcoholic, a philanderer, et cetera. I love the accuracy of the title of the landmark book in this field, Games People Play. While they’re out (a) making more – what for? I got no lock on the door – that’s no way to be. They can steal the rug from the floor – that’s OK with me. ‘Cause the things that I prize – like the stars in the skies – are all free. I have so much more than nothing. Most of us do. Whether or not all our dreams are fulfilled, are we not plenty-full?